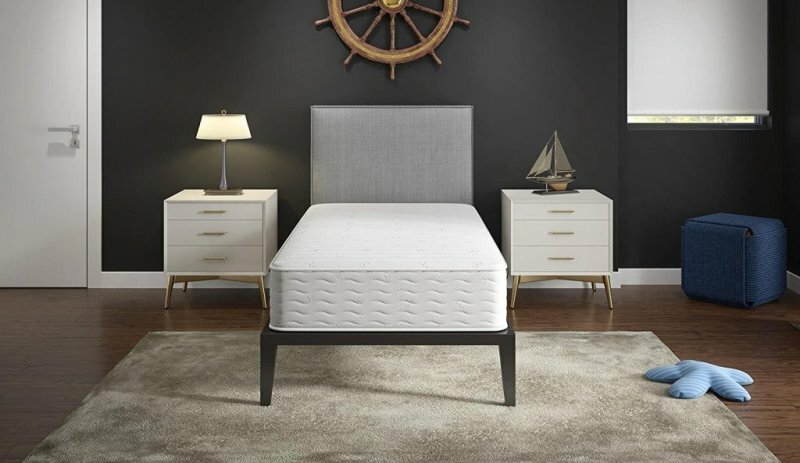 The Tuft & Needle Mattress is a high-grade, 10-inch foam mattress constructed with freshly poured T&N Adaptive foam that provides a bouncy and supportive feel that is just perfect for all sleeping positions. In fact, this Adaptive foam will allow you to sleep cool while providing you with right softness and great pressure relief (Localized-Bounce) so that you don’t disturb your sleeping partner. 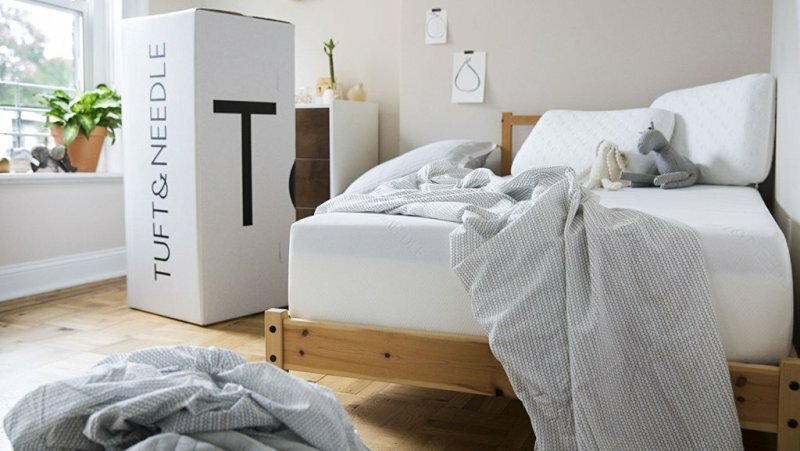 On the other hand, the Tuft & Needle Mattress foam makes it possible to compress the mattress into small-box for easy movement and shipment. Lastly, this mattress is available in different sizes ranging from twin-size to California-king size and also comes with a 100 Night-Sleep Trial plus an honest 10-year warranty that you can actually use. Constructed with freshly poured T&N Adaptive foam. It features a 10-inch thickness that offers great support. It’s very soft and adapts to the shape of your body. Provides a bouncy & supportive feel perfect for all sleeping positions. It can be compressed to fit into a small box for easy shipped. Offers great pressure relief and localized-bounce. It’s made in the USA using the highest-quality products. Engineered with the help of world leading scientists. A 100 night trial and a 10-year warranty for easy returns. Available in different sizes ranging from twin-size to California-king size. T&N Adaptive Foam allows you to Sleep Cooler & its More Supportive than Memory-Foam Mattresses. The Zinus is a Memory-Foam, 12-Inch Conforming Green-Tea Mattress designed to provide you with optimum comfort and pressure relieving support for a better night’s sleep. in fact, this mattress features 3-inches of Memory Foam, 2-inches of Comfort Foam, 3.5-inches Airflow of High-density Foam and 3.5-inches of Airflow High-density Base Support Foam which are all engineered to contour with your body in-order to provide you with the most comfortable sleeping experience while the infused Green-Tea extract and Castor Natural Seed-Oil helps to naturally retard odor and bacteria. The Zinus Memory Foam features a patented technology that allows for efficient compression, rolling and shipment in a small-box so that you can conveniently receive it to your door-step. Lastly, it’s recommended to allow this mattress to fully expand and get rid of any potential odor for about 72-hours after purchase. Conforming Green Tea Memory Foam comfort. Pressure relieving support for a better night’s sleep. 3.5-inches of Airflow High-density Base Support Foam. Available in different inches: 10″, 12″, 8″ & 6″. Available in different sizes from Twin-size to California-king size. Foam is CertiPUR-US Certified for durability, performance & content. Infused with Green Tea extract and Castor Natural Seed Oil to naturally retard odor & bacteria. Patented technology allows for efficient compression, rolling and shipping. Wait for about 48-72 hours for your new mattress to return to its original, plush shape. 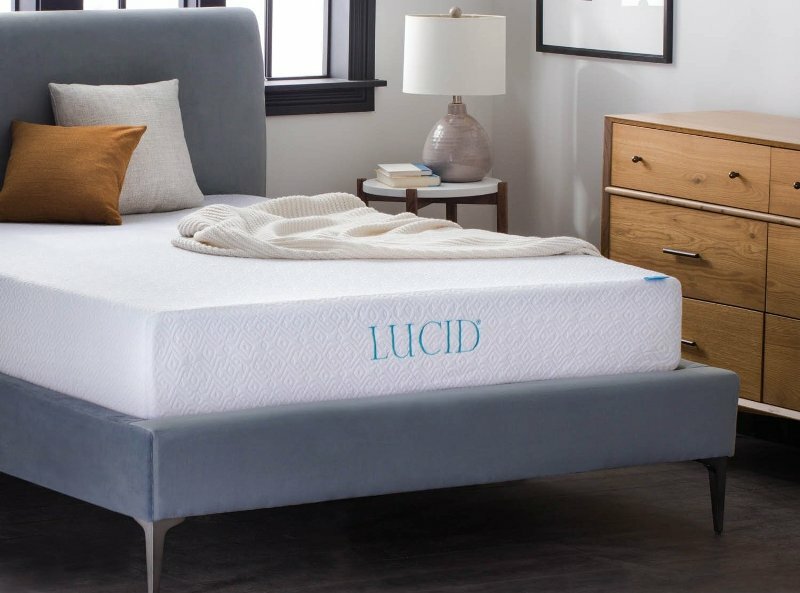 The LUCID 10 Inch Gel Memory Foam Mattress combines a 2.5″ gel-infused ventilated memory-foam surface and a 7.5″ high-density foam base in-order to provide you with optimum comfort and support when sleeping. 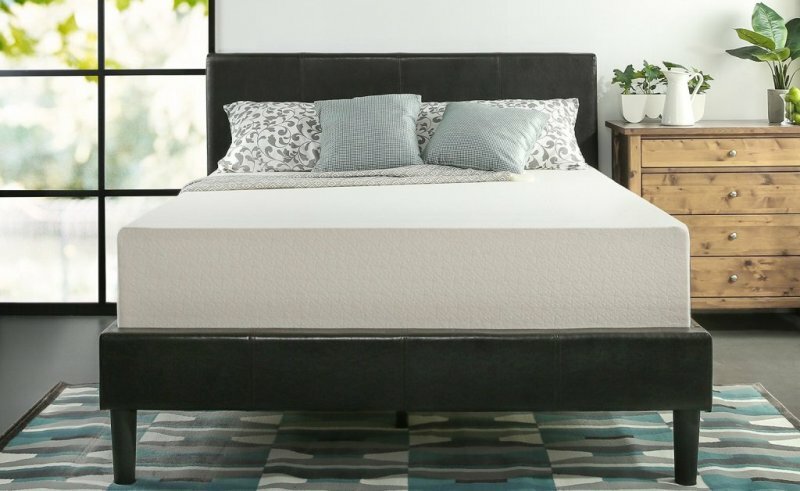 This Gel infused memory foam mattress regulates temperature while conforming to the shape of your body so as to ease pressure points while the included TENCEL blend fabric cover creates a comfortable air-layer that is moisture-controlling. 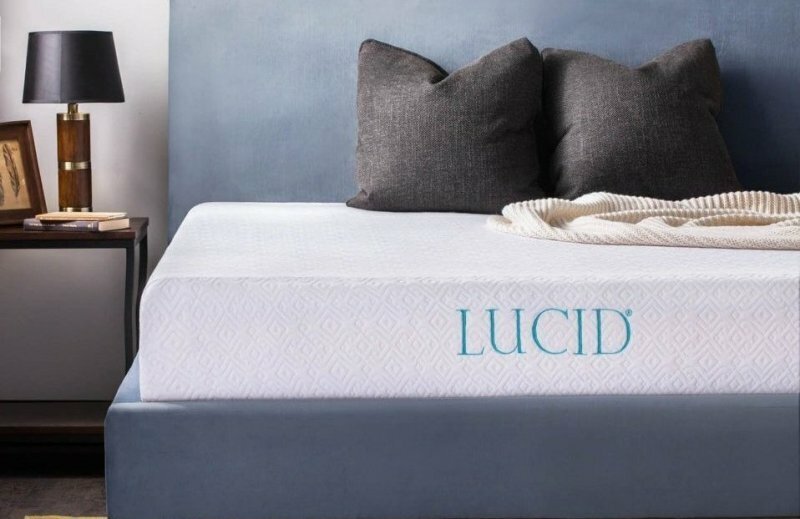 On the other hand, LUCID mattresses are compressed, rolled and shipped in an easy-to-manage box for convenient shipping and easy setup and they are CertiPUR-US certified based on independent testing for material safety, performance, environmental stewardship and indoor air quality. Lastly, this mattress is made with care and quality components backed by 25-year industry-leading warranty. It’s a 10 Inch Gel Memory Foam Mattress. It features a 2.5″ gel-infused, ventilated memory foam surface. It features a 7.5″ high density foam base for excellent support. Responsive open cell memory foam conforms to body-curves to eliminate pressure points. Infused with heat-capturing gel material to prevent heat build-up. Microscopic gel-beads capture heat & move it away from the body to regulate temperature. Surface layer features a ventilated design that improves airflow. The open-cell structure of LUCID memory foam ensures optimum durability. Features resilient foam that will not leave long-lasting body impressions. Features a cozy TENCEL blend fabric soft cover that creates a breathable air layer. 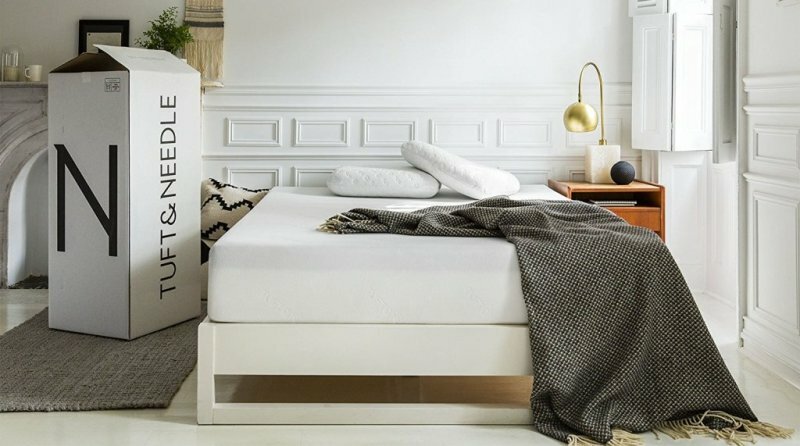 The foam used in this mattress is CertiPUR-US certified. This mattress does not contain synthetic or natural latex of any kind. Vacuum packed so that the mattress is easy to transport and set up. Made with care and quality components backed by a 25-year industry-leading warranty. 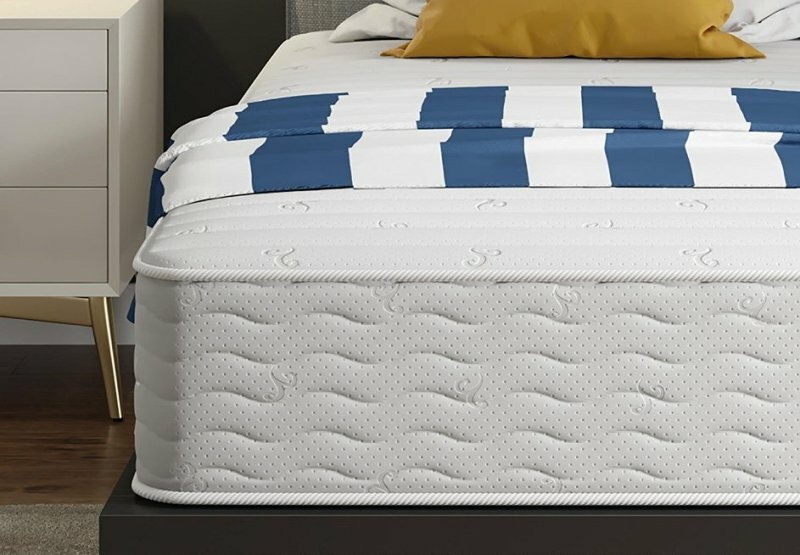 The Signature Sleep Contour is a 10-Inch Reversible Mattress with a layer of 2.5-inch high-density foam at the top and bottom coupled with independently encased coils for added comfort. In fact, this mattress is reversible in-order to allow you flip and rotate it so that you can even-out wear and make it possible for the mattress to last for more years to come. On the other hand, this mattress features a soft and breathable knit fabric cover that feels very comfortable while the versatile design of the mattress makes it perfect for use on multiple surfaces like on box-spring beds, bunk-beds, day-beds, platform-beds and trundle-beds. Additionally, this mattress is made with CertiPUR-US ® certified foam that is free of any chemicals, heavy-metals and its low in VOC-emissions to ensure indoor air-quality. 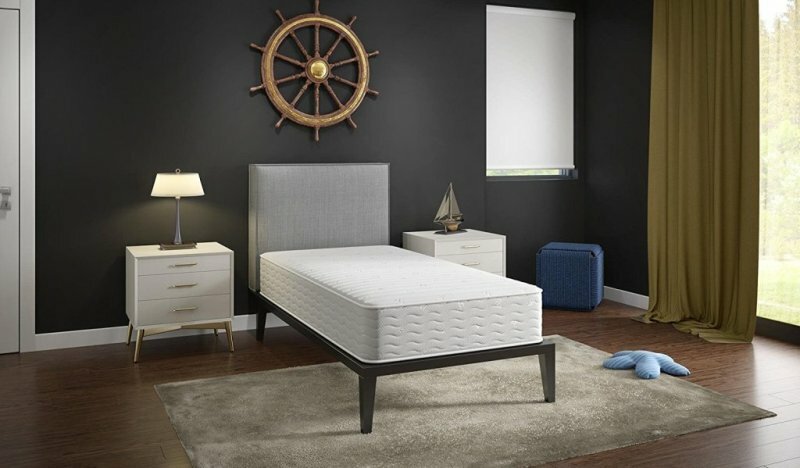 Lastly, this mattress Signature Sleep Contour 10 inch mattress is available in multiple size options which include; twin-size, full-size, queen-size and king-size. It’s a 10-Inch Reversible Independently Encased Coil Mattress. Features a layer of 2.5-inch high-density foam at the top & bottom. It includes a soft breathable knit fabric mattress cover. Works on multiple surfaces including box spring beds, bunk beds, etc. This mattress is made with CertiPUR-US ® certified foam. It’s free of any harsh chemicals and heavy metals. The Foam is low in VOC emissions for indoor air quality. Memory Foam Mattresses that delivers exceptional sleep support. Independently encased coil system provides optimal support and eliminates motion transfer. A convenient two-sided construction extends the life of the mattress. It’s available in multiple size options ranging from Twin-size to king-size. It is shipped compressed, rolled and vacuum-sealed for your convenience. Allow up to 72-hours for mattress to fully-expand & for any potential odor to dissipate. 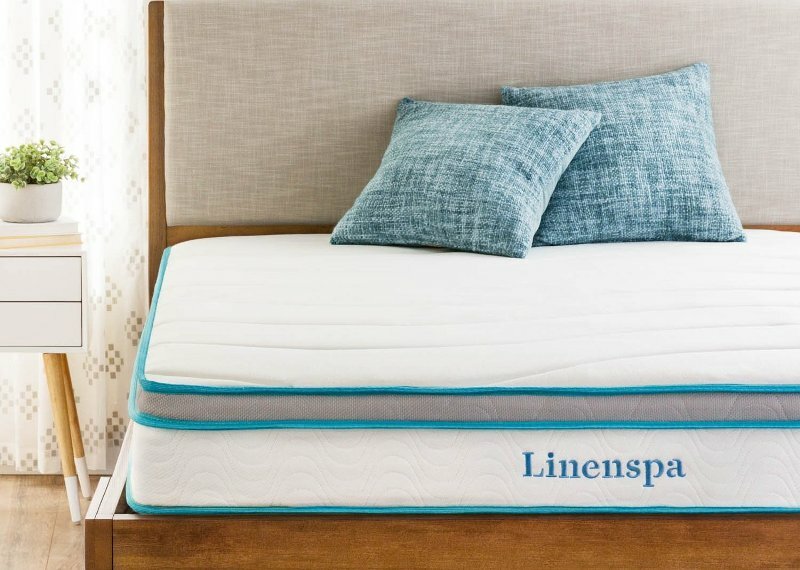 The Linenspa is an 8-inch, Memory-Foam and Innerspring Hybrid Mattress that provides a medium-firm feel and optimum comfort when sleeping. Additionally, the Memory-foam is quilted in a soft and knit fabric cover that feels very cozy while the 1.5-inch layer of foam beneath the quilted top layer helps to minimize pressure points. On the other hand, the felt-pads help to insulate springs for optimum smoothness, comfort and durability while the tempered steel-coils help to provide back-support with the right amount of bounce. 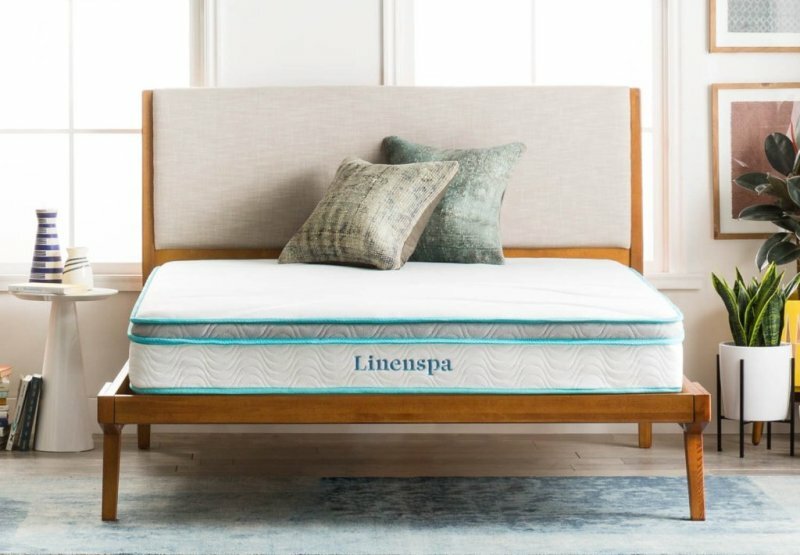 Lastly, the he LINENSPA 8-inch Hybrid Mattress is independently tested and certified by CertiPUR-US for safety, quality and environmental stewardship coupled with a 10-year warranty that protects the mattress and cover against manufacturer defect. An 8″ Memory-Foam and Innerspring Hybrid Mattress. A cozy layer of memory-foam quilted in a soft, knit fabric cover. A 1.5-inch layer of foam beneath the quilted top layer to minimize pressure points. Compressed and shipped in a box for convenient delivery & setup. Independently tested and certified by CertiPUR-US for safety & quality. Comes with a 10-year warranty that protects it against manufacturer defects. It is available in different sizes ranging from Twin-size to California-king size. It’s a great mattress for kids because it’s very durable and comfortable. 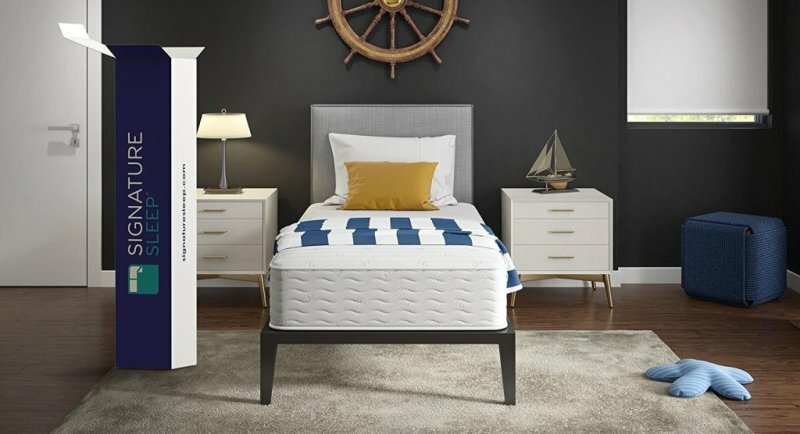 All the featured mattresses will work perfectly for adults and kids because they are very comfortable and durable compared to other mattresses on market in 2019. Additionally, all these mattresses are certified by CertiPUR-US for optimum safety, quality and environmental stewardship and they are even backed a great warranty against manufacturer defects in given period of time. Lastly, these mattresses are compressed and shipped in a box for convenient delivery and setup within your home.